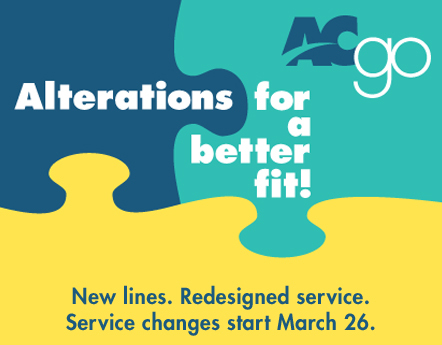 In 2015, AC Transit developed a district‐wide Service Expansion Plan (SEP) aimed at improving the existing service network by better meeting demand and providing more frequent and reliable service. AC Transit implemented the first phase of SEP, now known as AC Go, in June of 2016. The following bus service changes are being implemented on Sunday, March 26, 2017 as a continuation of the rollout of AC Go. These schedule updates will help simplify some parts of the system while improving on-time performance and service reliability. In the maps below, the discontinued lines appear with a yellow highlight. The replacement lines are numbered, and in color. Line 11 will be discontinued, but lines 18, 33, 96, and 611 will offer replacement service. Line 18 goes to Downtown Oakland, between Broadway & T.L. Berkley Way and Lake Merritt BART.Line 33 will serve Piedmont, Oakland Ave. or Harrison St., Westlake Middle School and Kaiser Center. Take Line 96 to E. 12th St., 14th Ave. and Beaumont Ave., Highland Hospital and the Dimond District. Line 611 will serve areas of former Line 11 at times convenient to Westlake Middle School. Line 18 will be split. Line 18 will continue to operate from Broadway to Lake Merritt BART on 7th St. and return on 8th St. The new Line 33 will provide service between Broadway in downtown Oakland and Montclair. Line 25 will be discontinued. Take Line 12 on Gilman St. or Hopkins St. and to Westbrae. Take either Line 12 or Line 79 on Martin Luther King Jr. Way. Take Line 79 to Fairmount Ave., Colusa Ave., or The Alameda and to Thousand Oaks. Take Line 80 on Buchanan St., Pierce St., or Central Ave., to University Village and to Pacific East Mall. Line 26 will be discontinued. Take Line 14 on 14th St. or Wood St. Take Line 29 on Lakeshore Ave. or Walavista Ave. and to the Grand Lake District. Take Line 36 on Adeline St. and in Emeryville. Line 31 will be discontinued, but lines 29, 57, and 96 will offer replacement service. Take Line 29 in West Oakland and on 10th St., Peralta St. or Hollis St. Take Line 57 on 40th St. and to MacArthur BART. Take Line 96 in Alameda. Line 49 will be discontinued, but lines 36, 79, 80, and 81 will offer replacement service. Take Line 36 to Dwight Way. Take Line 79 on Claremont Ave., Piedmont Ave. or Derby St., and to Clark Kerr Campus. Take Line 80 or 81 to Ashby Ave.
All trips on 51B will serve Berkeley Amtrak. Continue to take Line 51B to Berkeley Amtrak, University Ave. between 6th St. and Shattuck Ave., to Downtown Berkeley and the UC campus, and to College Ave. Take Line 81 to Berkeley Marina. Additionally, changes will be made to the following lines as detailed in the table link below. Line 275 will be temporarily suspended until further notice. AC Transit Flex service is available.